“You know, anybody count us out (for victory on Sunday), it’s a big mistake,” Kanaan said after topping the speed chart at the close of Friday’s final practice around the 2.5-mile IMS oval. The session was played-out before a crowd estimated at 100,000, largest since the split between the Indy Racing League and Championship Auto Racing Teams after the 1995 race. Kanaan, who will start 18th in the 33-car field in his No. 10 Chevrolet for Chip Ganassi Racing, cranked out a hot lap at 226.280 mph on the 28th of his 42 laps. 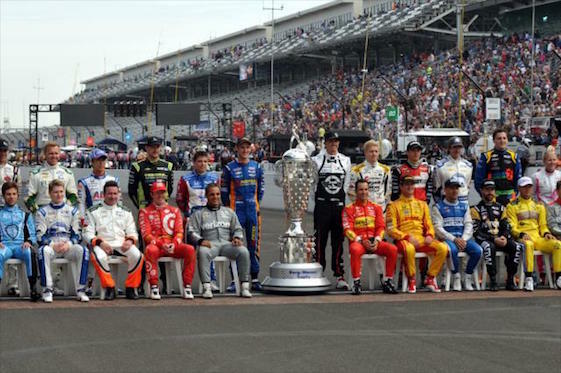 Drivers competing in the 100th running of the Indianapolis 500 assembled for the traditional class photo on Friday. Carlos Munoz of Andretti Autosport was second-fast at 224.772 mph in the No. 26 Honda, just ahead of Dixon at 224.606 mph in the No. 9 Target Chip Ganassi Racing Chevrolet. Dixon, the four-time/reigning Verizon IndyCar Series champion, won the Indy 500 in 2008. Series point-leader Simon Pagenaud _ winner of three consecutive races _ was 22nd at 222.581 mph in the No. 22 Team Penske Chevy. Juan Pablo Montoya, the two-time/reigning Indianapolis 500 champion, was 13th at 223.571 mph in the No. 2 Team Penske Chevy. Teammate Helio Castroneves, a three-time Indy 500 winner, was 10th at 223.959 mph in the No. 3 Team Penske Chevy. Will Power, runnerup to Montoya in last year’s race, posted the fourth-fastest speed at 224.384 mph in the No. 12 Team Penske Chevrolet. Ryan Hunter-Reay of Andretti Autosport was fifth at 224.327 mph in the No. 28 Honda. Pole-sitter James Hinchcliffe turned 48 laps and was 12th-fastest at 223.925 mph in the No. 5 Schmidt Peterson Motorsports Honda. More than 1,300 laps were completed during the extended 70-minute session, with Pagenaud and Charlie Kimball, driver of the No. 42 Chevy fielded by Chip Ganassi Racing, each logging 52. Tony Kanaan is out to give thew Borg Warner Trophy another hug. He won the 500 in 2013.
place finishes at IMS. Kanaan led 34 laps en route to victory in 2013, his final season with KV Racing Technology. 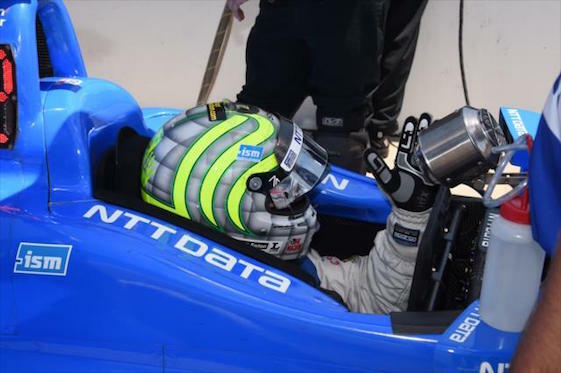 “The pressures of the race, it’s like I said, it’s been an unbelievable experience,” Kanaan said. “I’m so humbled to be able to be part of this. I mean, I’ve always wanted to be in this race since I was a little kid. I’ve never really came to this place until I actually raced in 2002, so I really haven’t experienced what people had told me when this place is sold-out, how does it feel when you go out, you know, go into the tunnel and you experience the crowd. Because it’s definitely more crowded. I’ve been here, like I said, for 15 years and I’ve never, never seen anything like this. The lone incident of the session saw Pippa Mann spin and crash in Turn 4, backing her No. 63 Dale Coyne Racing Honda into the SAFER Barrier. Mann’s day finished after 26 laps. All 33 cars now will sit idle until Sunday’s race. Coverage on ABC and the Advance Auto Parts INDYCAR Radio Network begins at 11 a.m. (ET). Dean Stoneman edged Ed Jones by 0.0024-seconds to win the Freedom 100 in the closest finish in IMS oval history during the premier event on the Indy Lights presented by Cooper Tires schedule. Starting fifth, Stoneman pushed his way into second place by Lap 9 in the No. 27 Andretti Autosport Dallara IL-15. He passed pole-sitter Jones for the lead on the next lap and, while Stoneman led 30 of the final 31 laps at the start/finish line, the pair swapped the point numerous times throughout the race. Jones took the lead on the final restart, a one-lap shootout following a caution to retrieve the stopped car of Heamin Choi. Stoneman and Jones raced side-by-side heading into Turns 3 and 4 on the final lap, setting up a drag race down the frontstretch to the checkered flag. The margin of victory was a few inches. Team Penske’s Helio Castroneves celebrates victory in the pit crew competition. the fence in front of the Tower Terrance grandstand. Castroneves beat Mikhail Aleshin of Schmidt Peterson with Team Pelfrey in the final round. Castroneves scored the 17th win for Team Penske in the annual competition for Indy 500 pit crews , an event that started in 1977. 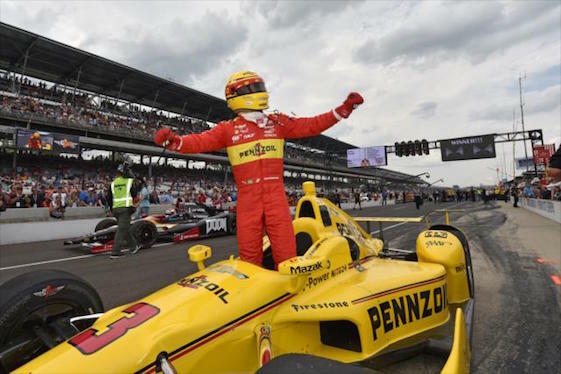 Winner of the competition has gone on to victory in the Indianapolis 500 six times, most recently with Castroneves in 2009. Three-time Indy 500 champion Johnny Rutherford, longtime driver of the Verizon IndyCar Series pace car, was honored prior to Carb Day practice by drivers and crew members on a ceremonial lap along pit road. Rutherford, 78, is turning over pace car duties following Sunday’s Indianapolis 500 to Sarah Fisher. “Lone Star J.R.” also received a special award from Firestone Racing commemorating “54 great years at Indy _ 500 winner, driver coach and Pace Car driver” and a banner signed by all 33 drivers in the 100th running. “(It was) a total surprise to me,” said Rutherford, of Fort Worth, Texas. “I thought we were just going to go out and to do a radio check with the pace car. We did accomplish that, but when I pulled her out and saw all the crews and all the people (on pit road), it was fantastic. I was in total shock. Rutherford qualified for 24 Indy 500s between 1963 and 1988. Rutherford won in 1974 in the No. 3 McLaren/Offenhauser, and in 1976 in the No. 2 Hy-Gain McLaren/Offenhauser _ the latter from pole position. Ironically, he finished 33rd and last in the 1977 race as defending champion after the gearbox broke in his No. 2 1st National City Travelers Checks McLaren/Cosworth. Rutherford’s final Indy 500 victory in 1980 also was launched from P1, this time driving the famed No. 4 Pennzoil “Yellow Submarine” Chaparral/Cosworth fielded by fellow-Texan Jim Hall. Rutherford won the U.S. Auto Club and Championship Auto Racing Teams driving titles that season. Rutherford is a charter member of the Texas Motorsports Hall of Fame at Texas Motor Speedway in his hometown. The winning driver of the annual June Verizon IndyCar Series summertime night race at TMS receives the Foyt-Rutherford Trophy, named for J.R. and fellow-Texas legend A.J. Foyt Jr. The Honda PR team of Dan Layton, left, and T.E. McHale, right, was named winner of the 2016 Jim Chapman Award. motorsports public relations. 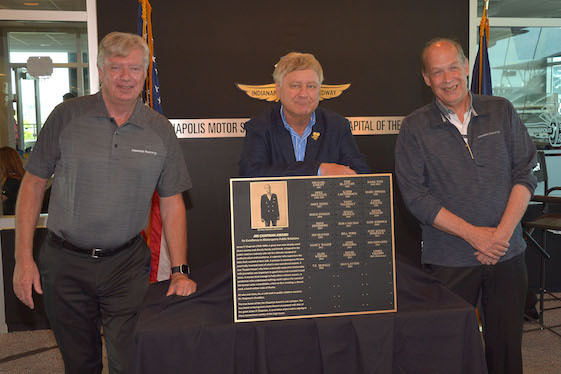 McHale and Layton were presented plaques Friday morning in the Indianapolis Motor Speedway’s media center, where a new permanent trophy was unveiled and will remain. The Chapman Award honors the legendary PR executive and innovator who worked with baseball immortal Babe Ruth and was named Indy car racing’s “most influential man” of the 1980s. Layton is in his 22nd year representing Honda in Indy car racing. He also has handled public relations duties in sports car racing and Formula Atlantics, among other series. Tim Whiting, Dale Coyne Racing chief mechanic on the No. 63 Honda driven by Pippa Mann, was named recipient of the Clint Brawner Mechanical Excellence Award. The honor goes annually to the Indianapolis 500 chief mechanic who exemplifies the excellence, ingenuity and perseverance similar to that of the legendary Clint Brawner. Sponsored by Firestone Racing, the award includes a $5,000 prize and the winner’s name inscribed on a trophy that permanently resides in the IMS Museum. … Kody Swanson of Kingsburg, Calif., became a three-time winner of the Hoosier Hundred U.S. Auto Club Silver Crown race at the Indiana State Fairgrounds in Indianapolis, claiming Thursday’s race for the third consecutive year. Bryan Clauson, who will compete in the Indianapolis 500 for Dale Coyne/Jonathan Byrd’s Racing, finished fourth. … The Tatuus USF-17 chassis that will debut in the 2017 Cooper Tires USF2000 Championship powered by Mazda competition was unveiled Friday at IMS. It will be the series chassis for at least five years, following testing and development this summer. … Seventy-five years after surviving one of the most terrifying attacks on American citizens, eight survivors of the Japanese bombing on Pearl Harbor in Hawaii will be honored during pre-race ceremonies for the 100th Indianapolis 500. The survivors _ all from Indiana _ and their families will walk the red carpet behind the Panasonic Pagoda at 9 a.m. Following Verizon IndyCar Series driver introductions, the group will be honored at11:45 a.m. during a ceremony and video commemorating the surprise attack on Dec. 7, 1941 that drew the United States into World War II.